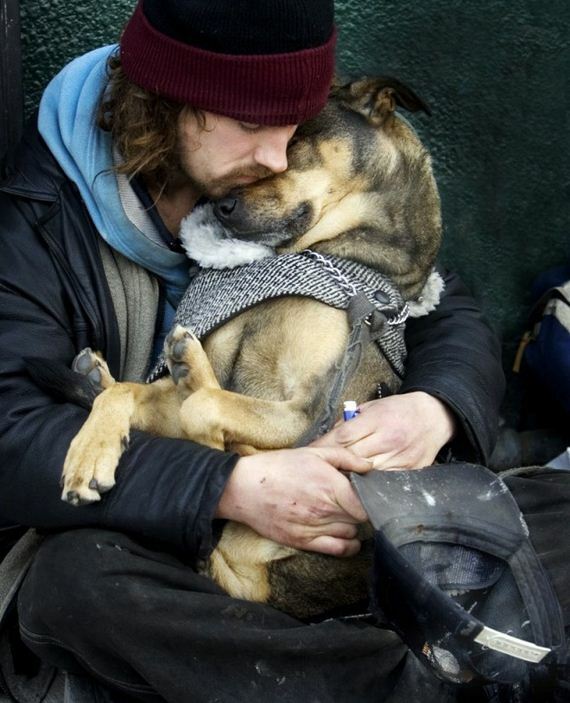 That’s what the story you’re about to hear is about – the love between a dog and his human, regardless of the circumstances that surround them. The story emerged from Reddit, where lots of personal, touching stories do. A homeless man known only as Boxer spends a lot of time outside a California tattoo shop panhandling. He is known to the regulars, and manages to get a fair amount of money. One day, he shared his story. The story of Boxer, and his dog, Joe. He had been homeless since he was 15 years-old. Without a high school diploma, finding sustainable work was nearly impossible, so Boxer committed to the unstable life of panhandling. His diet consisted mainly of fast food, and it was on a routine run to McDonald’s in 2006 that his life changed for the better. While eating his sandwich, Boxer heard some whining and shuffling. Joe was the cause of all that noise. When Boxer found the pup (who was no more than a year and a half old), Joe had a collar on but was clearly lost. Boxer borrowed a phone and called the number on Joe’s collar, hopeful that his owners would be relieved to know he was okay. “There’s a reason he’s out there. We don’t want him,” was all he heard. From that moment on, Boxer and Joe were inseparable. There was a clear sense of closeness between the pair. Popular within their community, neighbors bought dog food for Joe and regularly gave Boxer food. For several years, these unlikely best friends were doing okay. One night, while the pair slept in an alley near the parlor, a group of violent men approached them demanding money, waving knives and making physical threats. Fiercely protective of his dear friend, Boxer says that Joe was growling in a way he had never witnessed before. The assailants were so aggressive that Joe eventually launched forward and bit one man’s arm, causing him to drop his weapon. Furious by this, the others attacked Boxer and, ultimately, Joe. They stabbed the brave dog and ran off, leaving him to die, whimpering, next to his beloved human. Boxer says Joe’s tail wagged until his very last breath. Not surprisingly, Boxer was stunned by this devastating night. After a while of trying to cope with the grief of losing his friend in such a tragic way, Boxer decided the best way to honor Joe was with a tattoo. The guys at his local tattoo shop volunteered to do the work for free. After memorializing his best friend, Boxer’s life slowly started to turn around. He was given some janitorial work at the parlor and began getting back on his feet. He even managed to get his own place, just a couple blocks from the shop! As a gift, the guys from the tattoo parlor surprised Boxer with a puppy. They said they hadn’t seen Boxer smile so genuinely since getting the tattoo of Joe. Such a beautiful story – it’s amazing what a loyal friendship can achieve. Didn’t know I could smell onions over the internet. Sorry but really? This picture has been around for ages and might I add that no one demands money from a Homeless Man, lol. Come on now, a HOMELESS man is the one with all the money??? SMDH Great story if it were true. Susan, perhaps this story is someone’s imagination and perhaps it is true but your comment about Homeless being robbed is what got me the most because it shows how ignorant you are of the every day plight of the homeless. YES, they are brutally robbed, beaten and even killed and their dogs are killed too. It is hell on the streets for the homeless…they are easy prey. I am tearing up as I read this…my God…incredible story…I am so sad…Joe is in a good place ..God watches out for the “Joe’s “of the world!